I am on a mission to contact people re: colorpad. The person who made colorpad chatted with me the other day. I am in contact with him on and off. Please regard my site as the 'official colorpad site' as I will be hosting a link to it and supporting it as much as I can. I have only seen colorpad 'break' a few times and I know how to fix it. I will make a free video to explain it should it ever 'break' on anyone. 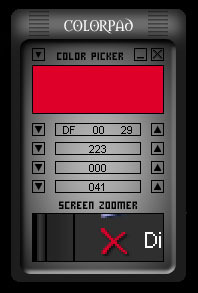 http://www.d00db0x.com/colorpad_demo.html <--- FREE INSTRUCTIONAL VIDEO ON COLORPAD. A little info about me...I was the first person to ever skin colorpad seconds after the Author released a skinnable version and announced it to skinz.org (back when it was a good site) I released my skin 'Ascii Pad' to go with it.